Still no Yurine story. Of course, since he and Akagi are the main focus of the series, they are never short of scenes. This episode brings more focus on Tsutsui and her relationship with Akagi as she takes over as the liaison between the police force and ST since Kikukawa is being reassigned to a posh…desk job. We witness a murder in a park where a young man is stun gunned on the back of his neck and once he collapses, the hooded figure strangles him without mercy. Akagi and Yurine head out to the scene as usual and Akagi is his typical self, this time his acerbicness is really focused on Tsutsui who he refers to as an idiot who should just quit if she can say only the obvious (sounds like he’s talking to Kikukawa doesn’t it?). At the ST office, Kikukawa makes the announcement of his departure and says he will still be on hand to help. Of course Tsutsui is happy to jump into his role and no one protests his leaving which makes Kikukawa very sad since he’s worked with ST for two years now…even if they do annoy him quite frequently. The victim’s wallet was stolen, but the police are easily able to identify the man by running his prints. That means he had a criminal records. Turns out that when he was 17, he got drunk and murdered a 21 year-old young man. So the first thing our team does is go to check on the parents who are now divorced since their son’s death. Both mother and father have a solid alibi for the crime. Yurine meets with Matsuda and Takahashi. Their relationship seems somewhat better, but Matsuda is brusque as usual with Yurine, especially when there are no leads in the murder investigation. Then a second murder occurs! It’s the same MO and the victim is another murderer. He stalked and killed a young woman a year ago, but due to lack of evidence, went unpunished. Again, the parents are suspects. The husband and wife are still together in this case and the wife practically became a hermit after her daughter’s death. An interesting fact is that the father is a professor of criminal psychology. The team spin their wheels and get nowhere. Akagi and Tsutsui, although they are constantly butting heads, have the same theory—exchange murder. Mother number 1 kills murderer number 2 for mother number 2 who kills murderer number 1 for mother number 1. The problem is that neither mother fits the profile. One isn’t educated enough and definitely couldn’t pull of a flawless murder (which makes Akagi hate the perpetrator for leaving no real evidence), and the other is educated, but cannot restrain her emotions enough. Tsutsui event gets a geographic profiling lesson from Aoyama much to Akagi’s surprise. Aoyama makes a statement where another dead body would help narrow the profiling and then apologizes as that wasn’t right to say. Yurine doesn’t scold her and just says it is a good thing that Aoyama is able to realize that isn’t right. There is a cute scene where Akagi accuses Tsutsui of being as useless as Cap and spinning her wheels and she answers with a very Akagi-like comment which has Yurine worried. It’s bad enough Tsutsui spins like him, it’s even worse if she spins like him and has an attitude as bad as Akagi’s. With the case going nowhere, the team focuses in on any point of connection they can possibly find between the two women. 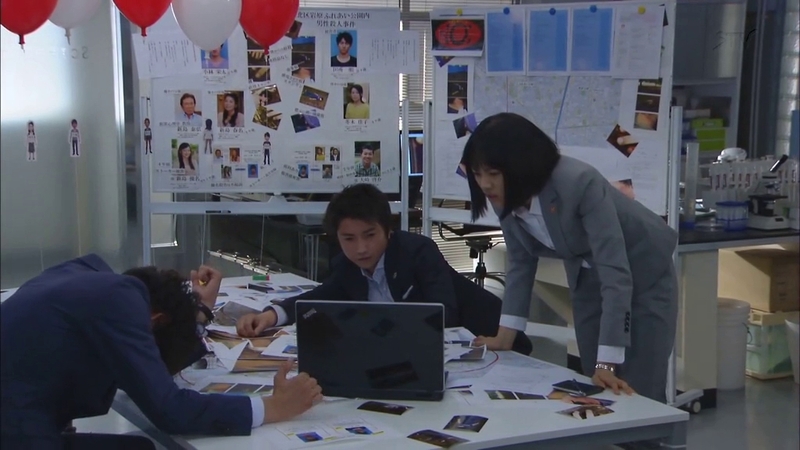 Tsutsui canvases and interviews while Akagi takes to the net an finds that the two women actually met online. They bring the two mothers in for questioning and get nowhere. The two women pass each other in the hall and clearly don’t know each other. So they just met online. So how was this whole thing orchestrated. Akagi is very upset when Tsutsui manages to dig up information to help his theories. Not enough to finish solving the case, but a step in the right direction. Akagi is depressed and scolds Yurine for being completely useless as even Tsutsui helped the case while Yurine contributed nothing. This sends Yurine to his laptop to glance at all of his compiled notes (he’s trying to get away from his notepad) when all of his notes are suddenly deleted—all that hard work for nothing! And this is just what Akagi needed to help him put the final pieces of the puzzle together. So they confront the criminal psychologist with Aoyama in tow. They ask several questions and the man, as smart as he is, can’t keep completely calm and eventually gives telltale signs of lying. Turns out he orchestrate the whole thing and planned everything down to the tiniest detail. The team find the written letter with instructions on how to complete the murder. At the same time, Tsutsui is at mother number 1’s house and finds the original letter among her letters of support from when her son died. BUSTED! The psychologist had hoped to turn all blame on himself, but that original letter shows everything clearly, thus his perfect murder is botched. The man then confesses he only did that because of his wife’s fragile state and how he had to stop her over and over again from just running out of the house with a knife to kill the young man who murdered their daughter. Akagi then gives him a speech how he’s just another murderer. Kikukawa stops by the ST office where he gets a card and random presents from the team. He complains about the simple sendoff, but you know he’s touched, especially when he fights with Akagi to keep the stuff when Akagi tried to take it all back after Kikukawa complained. Kikukawa leaves in a huff, but outside the office he breaks into a beaming smiling. Akagi and Yurine end up at Saegusa’s as always. Akagi worries over becoming a monster like the intelligent psychologist and Yurine assures him that will never happen as he will keep Akagi in check (and now I’m just waiting for something horrible to happen to Cap so Akagi can’t be kept in check). Anyways, during this discussion of becoming monsters and killing somebody to avenge a loved one, Saegusa is acting very strange and Akagi notices this. Guess we’ll find out shortly just why Saegusa left and just why he’s uncomfortable about this talk. Overall, this was a cute episode just to watch Tsutsui and Akagi bickering. Akagi and Cap bicker in their own special way, but this is very different. Not that you get romance too much, but Akagi and Tsutsui would make a cute couple.